BB1279 1104 ACSI Electrified Hinge - HAGER 4 Wire 4 1/2" x 4 1/2"
BB1279 1104 ACSI Electrified Hager Hinge is a 4-1/2” x 4-1/2” Electrified 4 Wires (28gauge) Hinge. T..
ACSI Electrified Ives 5BB1 1104 Electrified – 4 Wire 28 gauge Hinge. 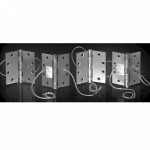 ACSI catalog	Electrified H..
TA2714 1104 ACSI Hinge Electrified - 4 Wire - 4-1/2" x 4-1/2"
TA2714 1104 ACSI Electrified McKinney Hinge is a 4-1/2” x 4-1/2” Electrified 4 Wire Hinge. Through W..
FBB179 1104 ACSI Electrified Stanley Hinge is a 4-1/2” x 4-1/2” Electrified 4 Wire Hinge. Through Wi..
BB1279 1108 ACSI Electrified Hager 8 Wire Hinge 4-1/2" x 4-1/2"
BB1279 1108 ACSI Electrified Hager Hinge is a 4-1/2” x 4-1/2” Electrified 8 Wire Hinge. Through Wire..
5BB1 1108 ACSI Electrified Ives Electrified – 8 Wire, 28ga Hinge. ACSI catalog	Electrified Hinge	Ava..
TA2714 1108 Hinge Electrified ACSI - 8 Wire 4-1/2" x 4-1/2"
TA2714 1108 ACSI Electrified McKinney Hinge 4-1/2” x 4-1/2” Electrified 8 Wire Hinge. Through Wire..
FBB179 1108 ACSI Electrified Stanley Hinge 4-1/2” x 4-1/2” Electrified 8 Wire Hinge. Through Wire – ..